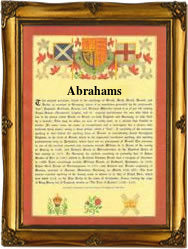 This long-established surname, recorded in the spellings of Abraham, Abrahams, Abrahamson, the latter two being patronymics, and the abbreviated Abrams, also a apparent patronymic, is of 12th century origin, and a 'Crusader' introduction into Britain. As such it was not Jewish, although of Hebrew influence. It is one of a group such as Isaac, Joseph, and Abel, which were given by the returning Christian soldiers to their sons in recognition of their 'visit' to the Holy Land. These subsequently developed into English surnames in their own right. 'Abraham' translates as 'The father of the nation', and as such was borne by the first of the Jewish patriarchs, (Genesis 11-25). The 1086 Domesday Book for London refers to 'Abraham', a priest in the established (Christian) church, whilst in 1170 Abraham de Stradtuna was recorded in the Danelaw rolls of Lincolnshire. As a Jewish surname it was revived after the 'reign' of Oliver Cromwell (1649 - 1658), who in 1655 repealed the exile order of Edward 1st in 1290, and allowed the re-settlement of the Jewish people in Britain. The earliest recordings include John Abraham of Bedford in the Hundred Rolls of 1273, and Magota Abrahams in the 1379 Poll Tax rolls of Yorkshire. Later recordings include Sarah Abram, who was christened at the church of St. Mary Abbots, Kensington, London, on November 5th 1646, whilst on June 17th 1666 Richard Abrahams was christened at St Dunstans in the East, Stepney. The Coat of Arms most associated with the name has a shield of lozengy, gold and red, on a black chief the sun in his splendour, gold. The first recorded spelling of the family name is shown to be that of John Abraham, which was dated 1197, in the pipe rolls of Northamptonshire, during the reign of King Richard 1st, known as 'The Lionheart', 1189 - 1199. Surnames became necessary when governments introduced personal taxation. In England this was known as Poll Tax. Throughout the centuries, surnames in every country have continued to "develop" often leading to astonishing variants of the original spelling.